So many of the large-flowered clematis in my garden are blooming extremely early this year, as much as six – eight weeks ahead of schedule. But whenever they choose to bloom, they look wonderful! During my frequent strolls through the garden, I enjoy observing clematis in all their various stages–and, yes, sometimes I even talk to them. This spring, Clematis ‘The First Lady’ talked back loudly, showing herself off to great advantage. 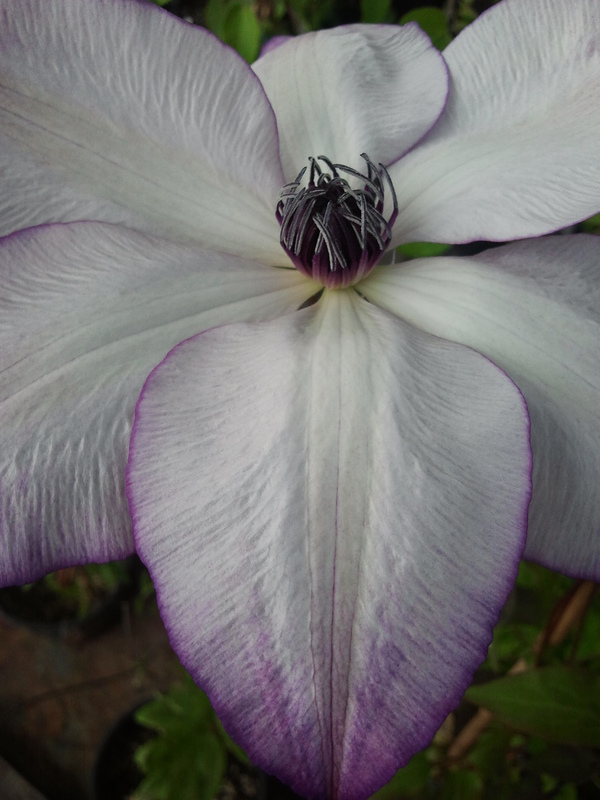 I purchased this clematis two or three years ago as Clematis ‘Rhapsody’, a clematis for which I had been hankering for some time. 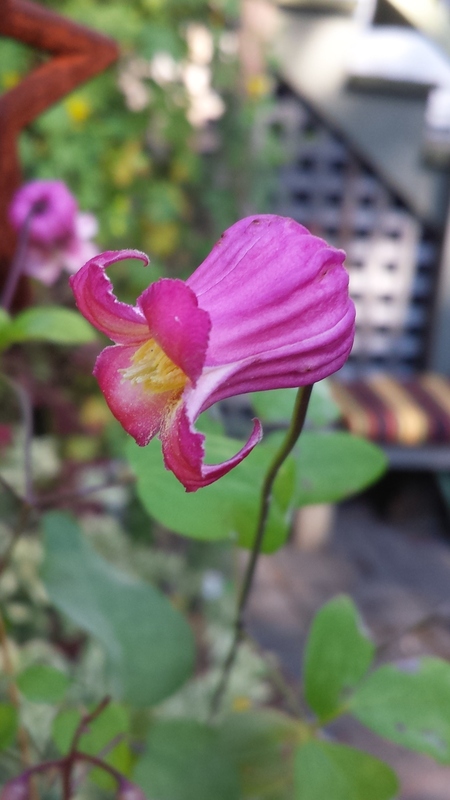 Once I saw the first meager bloom, I knew I had purchased a misnamed plant. But not until this year, when the poor clematis had built up enough strength to drag itself up out of the heavy shade of a big Fatshedera into the sunshine, did I really see what a gorgeous flower my mistake clematis produced–large lavender blooms (one flower actually measured 9 inches in diameter! ), with contrasting burgundy stamens, ruffled edges, and textual ridges in the middle of each pointed petal. Elegantissimo! 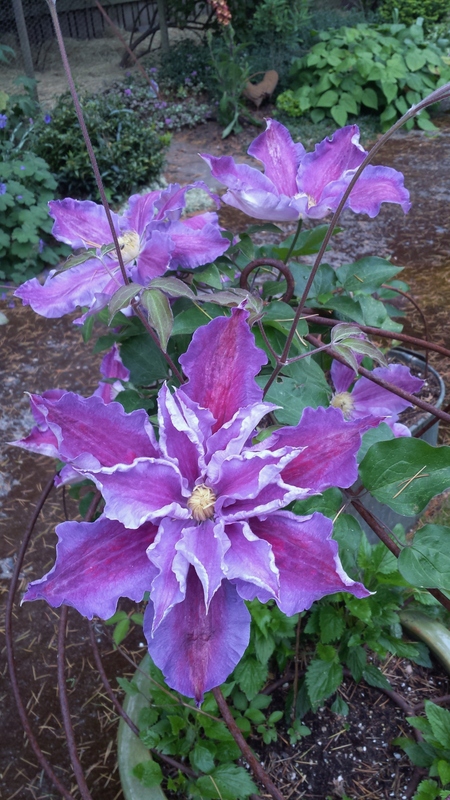 I was able to identify it as Clematis ‘The First Lady’ and seriously considered deeming this tough and beautiful plant Clematis of the Month for this month. 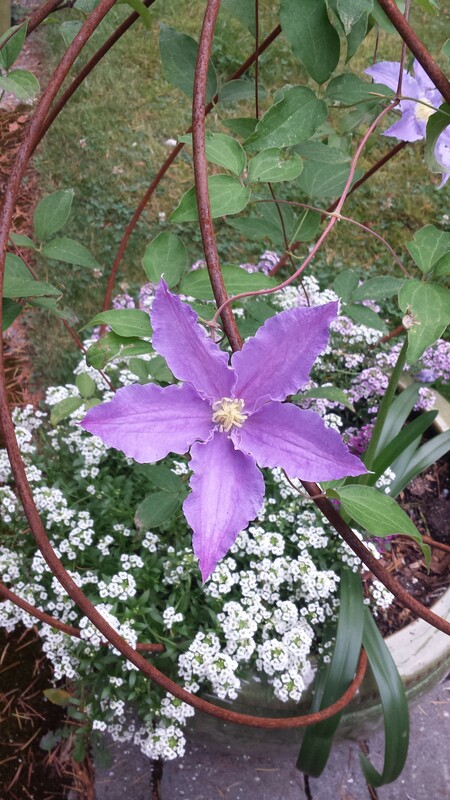 Serendipitously, yesterday my yoga teacher described to me a clematis a friend gave her as a cut flower. She has a fine eye for detail, so I was able to identify her unseen clematis from her description as Clematis ‘The First Lady.’ I showed her a photo on my smart phone to be sure and impressed both her and myself with my quick ID. That clinched it–Clematis ‘The First Lady’ is Clematis of the Month for May in my garden this year! Clematis ‘The First Lady’ is an American clematis introduced into commerce by Arthur Steffen in Long Island, New York, in 1989. 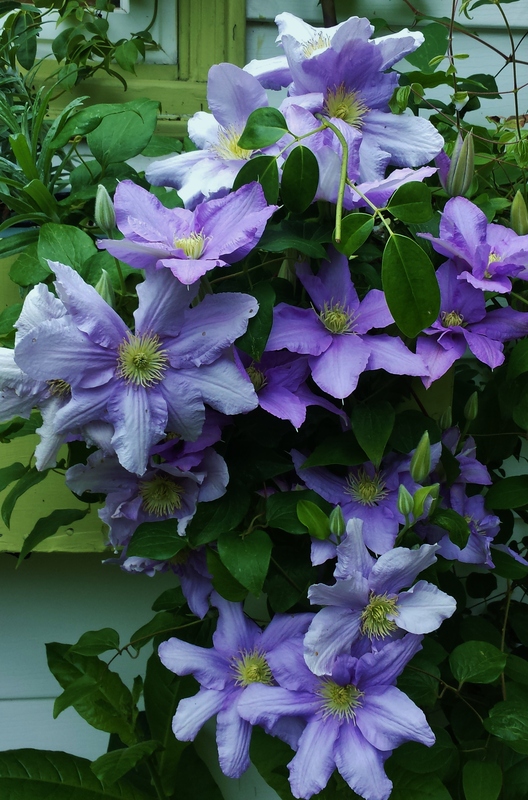 Mr. Steffen’s company is also responsible for introducing, in 1932, another gorgeous and famous American clematis, now grown throughout the world, Clematis Betty Corning. 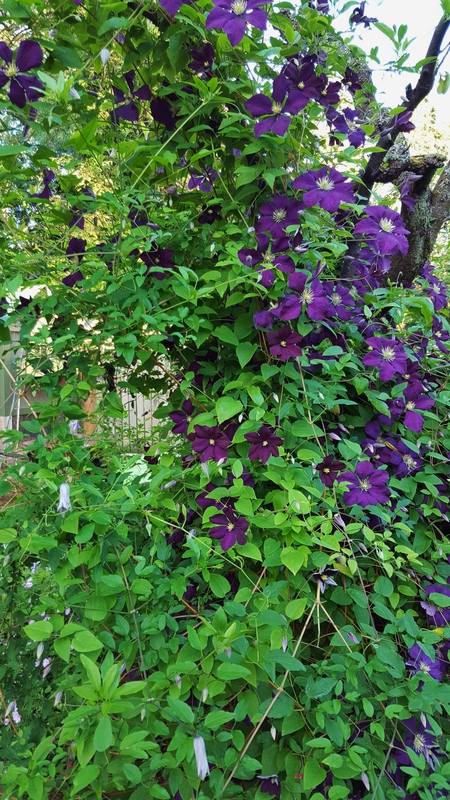 The beauty of the name of May’s Clematis of the Month is that you can choose your own favorite First Lady to be represented by this clematis. I know who mine is! Below is a smattering of the many other worthy candidates blooming in my garden this month. 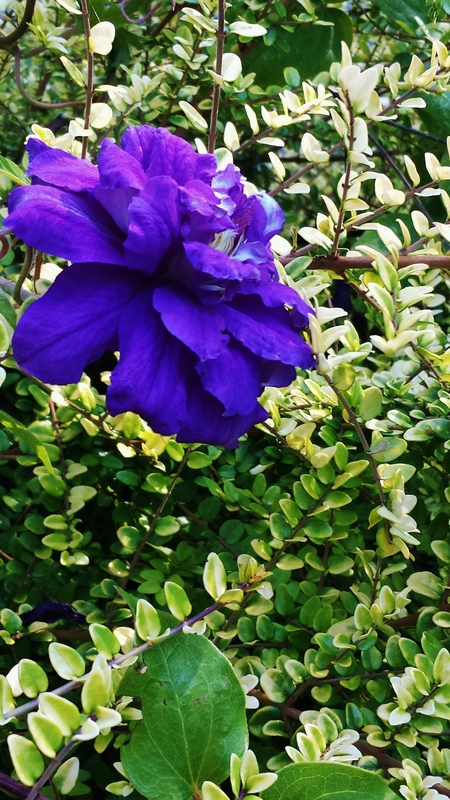 Clematis Fujimusume–such a gorgeous blue! 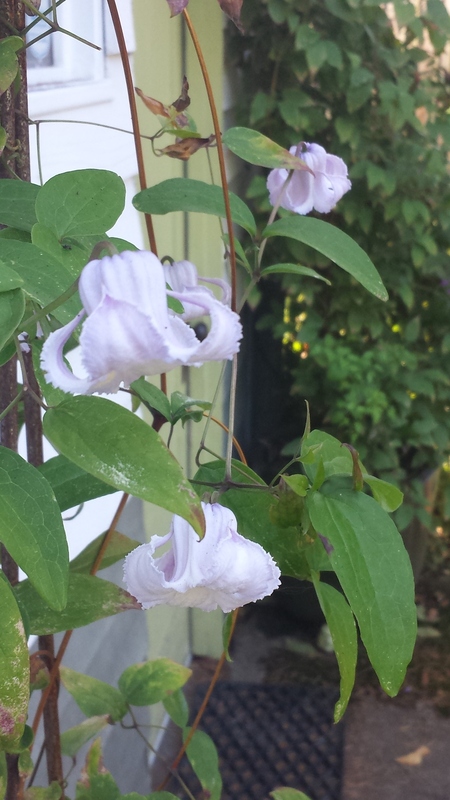 Clematis Morning Mist–one of these blossoms measured 10 inches! 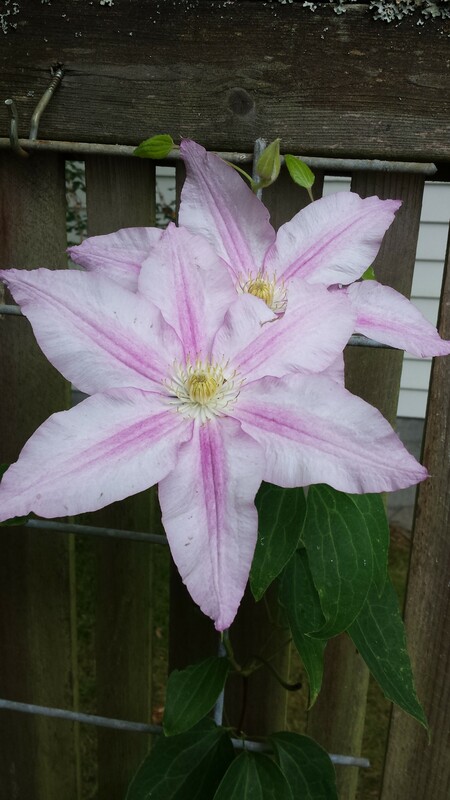 For the third year in a row here in Seattle, we have had the mixed blessing of a mild winter and warm spring–causing most clematis to bloom a full month early! Except for Clematis montana ‘Vera’, C. ‘Asao’ and all the clematis below would normally bloom for me in late May and early June, rather than in April. 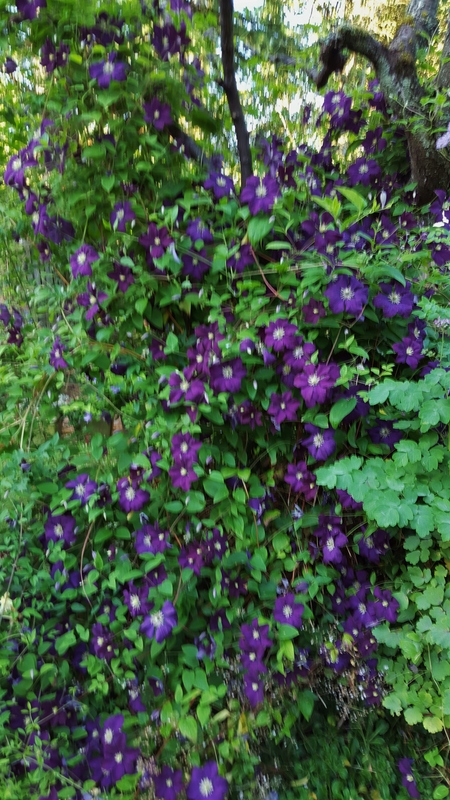 In my garden, C. ‘Asao’ is the Clematis of the Month for April because of its stalwartness, as well as its beauty. 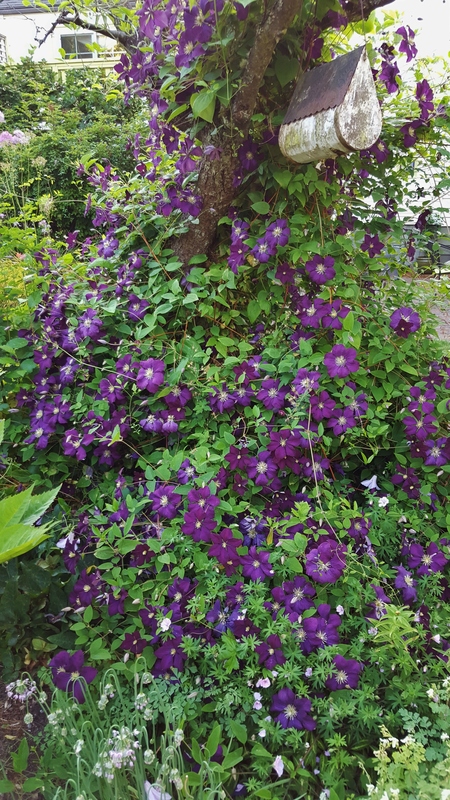 Since this clematis supposedly blooms on old wood, conventional clematis wisdom says that we should not prune it until spring, and then only lightly. Well, the problem for me was that I planted C. ‘Asao’ in two large window boxes on either side of the front door. In winter, they are downright ugly with big crusty, rusty brown leaves . Yuch. So a few years ago, I worked hard to dig them out and replaced them with plants that bloom on new wood and can therefore be cut back in the fall, at least they can be in the Seattle area. Unfortunately, the two replacements, C. ‘Parisienne’ on one side and C. ‘Justa’ on the other, didn’t stand a chance. ‘Asao’ may have been down, but not out for the count. Both specimens slowly came back from a few stray roots I didn’t clear away and crowded out their replacements. Hrmph. I ruthlessly cut them back every fall anyway and guess what! They grow fast and bloom beautifully with single and semi-double flowers right on time–and they do it on new wood! Go figure. 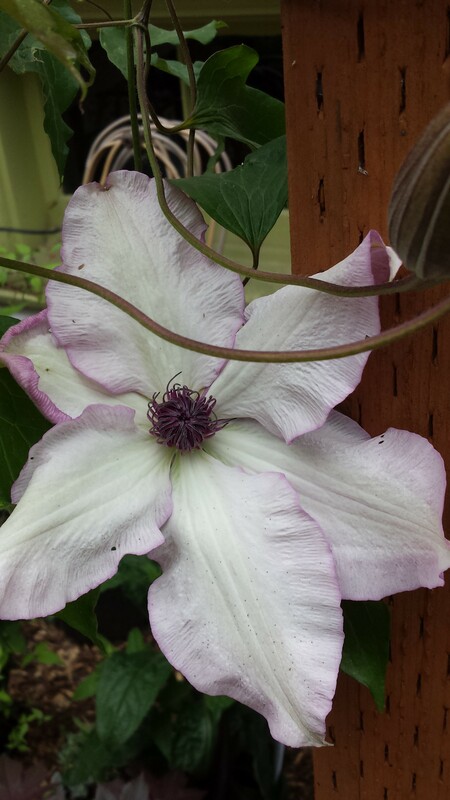 Clematis montana ‘Vera’ blooming 40′ up in an 80′ Port Orford Cedar. Due to scads of April sun, blossoms are nearly white rather than the more usual pink. Clematis ‘Guernsey Cream’, always the first large-flowered clematis to show off in my garden, is such a welcome sight after the winter doldrums. 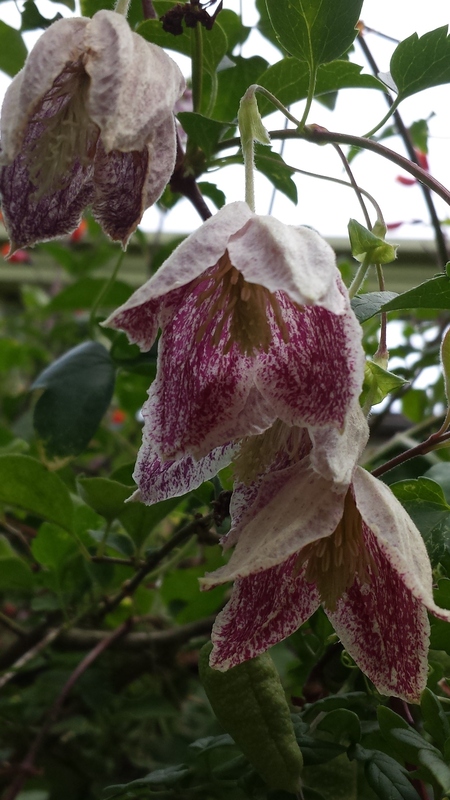 Clematis ‘Will Baron’ invariably follows close on the heels of C. ‘Guernsey Cream’. 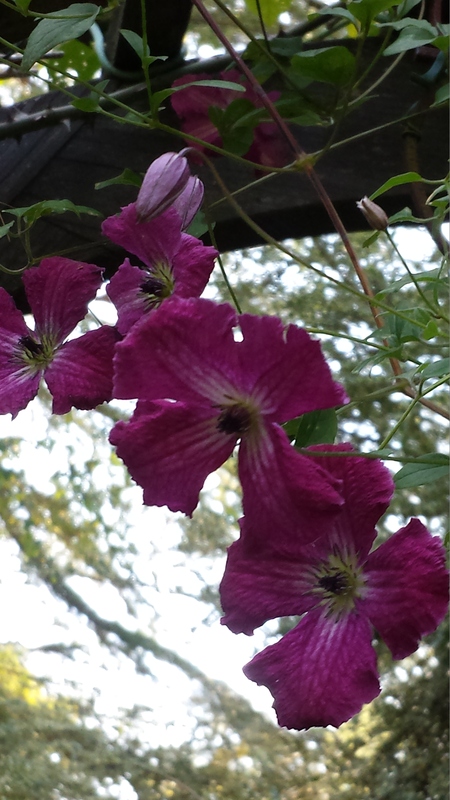 Poor Clematis ‘Fair Rosamond’ had to be unceremoniously removed from her climbing structure in March due to a tree fall. Never fear, no people or pets were harmed, damage was mainly superficial, and insurance covered it all! In spite of the ill treatment, C. ‘Fair Rosamond’ bloomed beautifully, draped over a nearby plant and lounging on the ground. She’ll be returned to her usual spot after she finishes blooming. And then there is the show-stopping Clematis ‘Josephine’. Her blossoms speak for themselves. Clematis ‘Crystal Fountain’ just opening its first bloom. 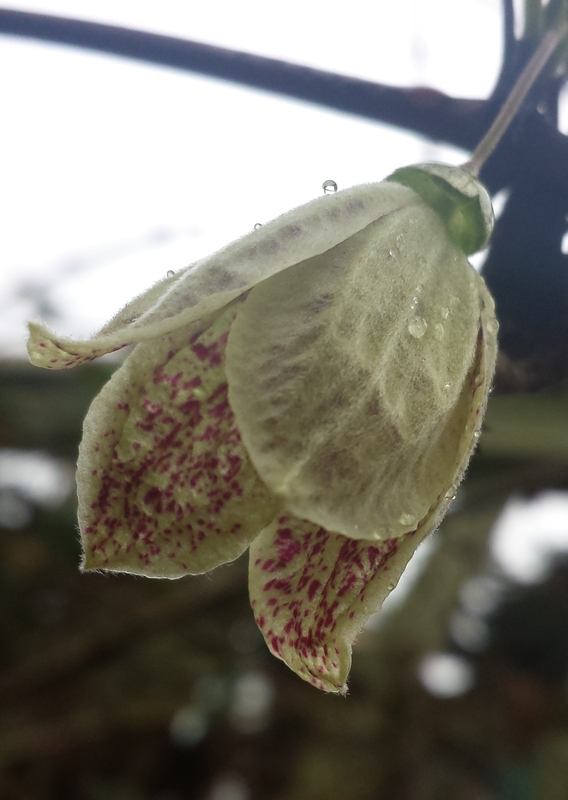 First dainty bell on Clematis ‘Kahori no kimi’. 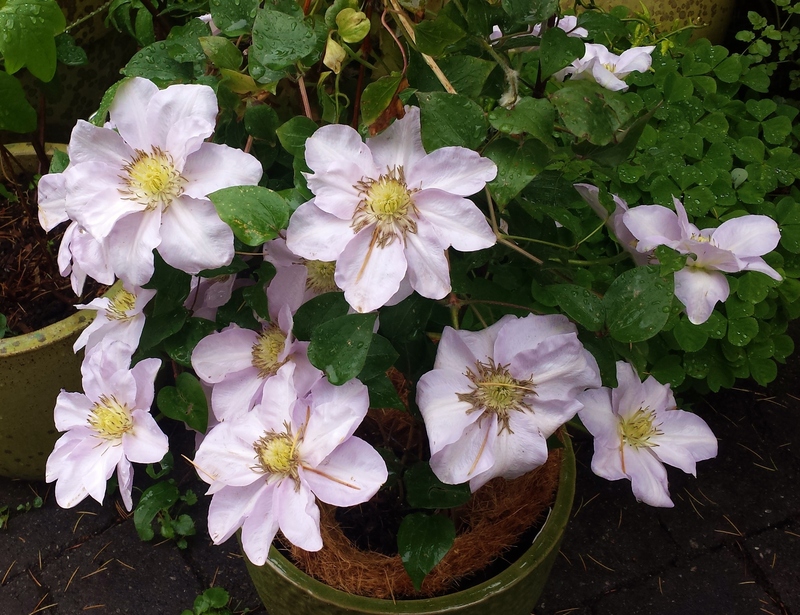 Clematis ‘Louise Rowe’ always seems to have a special glow, whether pale lavender or sun-faded white. 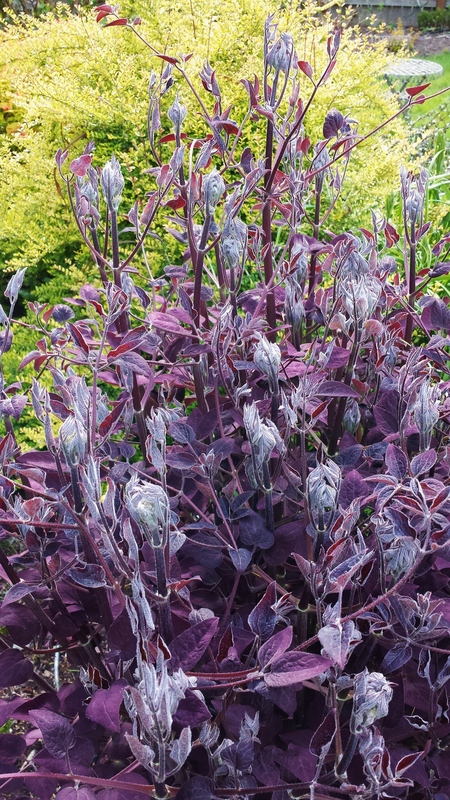 The fabulous rich purple of the leaves and stems of Clematis recta ‘Purpurea’. And check out the juicy buds about to burst into tiny white and fragrant flowers. Stay tuned, because many, many clematis buds are swelling, elongating, and titillating my spirits. I will have more and different beautiful clematis to show soon. Clematis texensis, a species clematis from the river banks of Texas. What a summer we had this year! Zero rain coupled with excessive heat (at least as far as Seattleites are concerned). Blech! 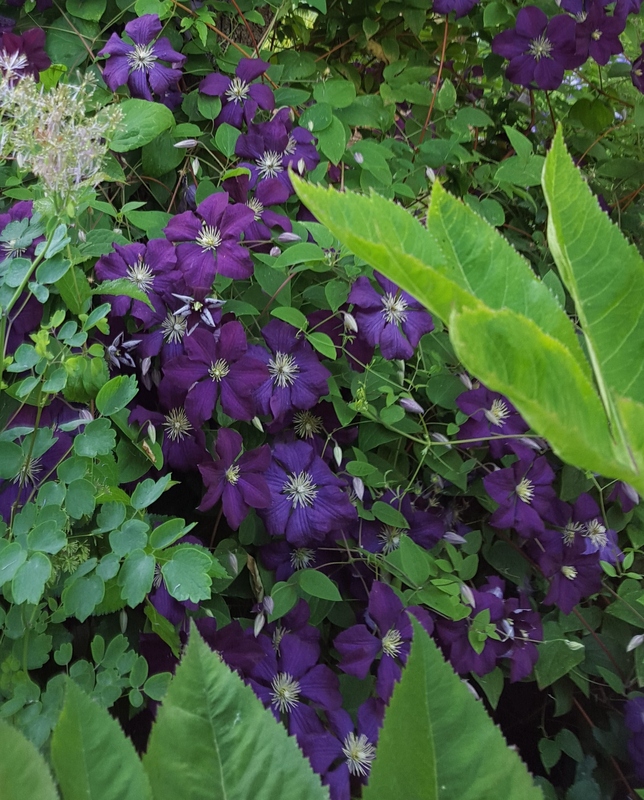 I didn’t have the spirit to venture into the garden half the time because so many plants, clematis included, were suffering–in spite of irrigation (as much as I could afford, anyway). Even so, I managed to take a few photos in my hot and arid Pacific Northwest garden (sounds like an oxymoron!). The standouts in July turned out to be the heat-loving Clematis texensis clan, including the first flowers from my first-to-bloom C. texensis species (see photo). The tulip-shaped blossoms in the species range from scarlet to dark pink, with white, red, or yellow coloring on the inside of the petals. Blooming above C. texensis in this photo are the light blue bells of another species, C. crispa. In the late 1800s European hybridizers loved the red color and tulip shapes of the blossoms of C. texensis and used it extensively in their hybridizing programs. More than one clematis expert has told me that almost all red and dark-pink clematis are descended from C. texensis! 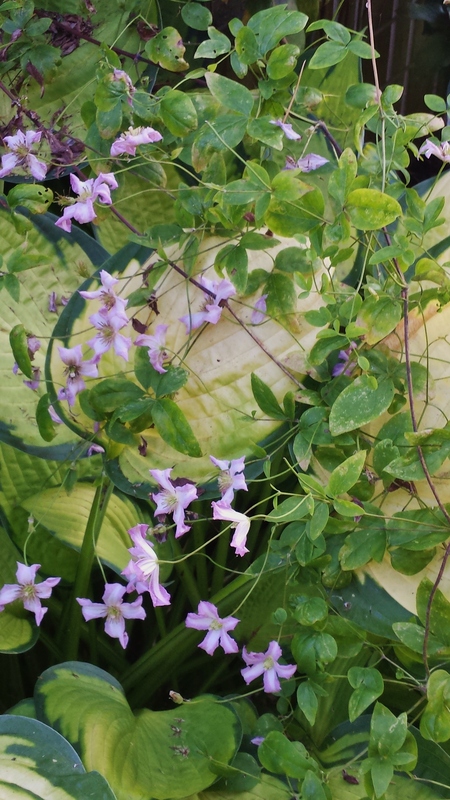 Also blooming in my garden in July were two texensis hybrids : C. Ville de Lyon climbing up a Decaisnea tree (also called Dead Man’s Fingers for it’s steely blue finger-like seed pods) and C. Catherine Clanwilliam. Clematis Ville de Lyon, a C. texensis progeny originally hybridized in France in the late 1800s. Clematis Catherine Clanwilliam, another child of C. texensis, this one hybridized more recently by British hybridizer, Barry Fretwell. 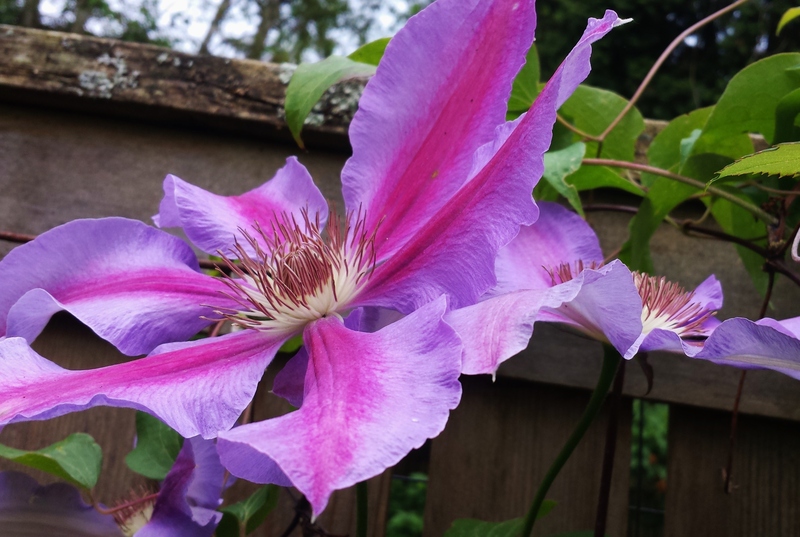 Seattle’s unusually long warm spring propelled all my clematis, as well as most of my other garden plants, into bloom a full month early this year–starting in March and continuing through April and May. And then June was no different! 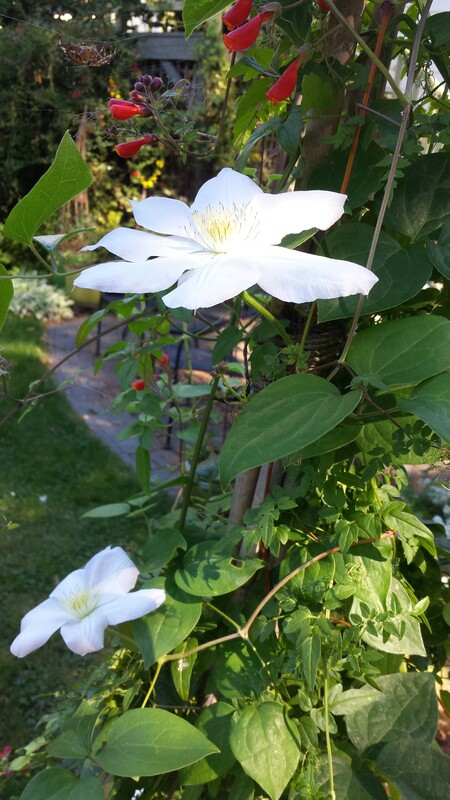 The usual stars in my June garden are early large-flowered clematis like C. Will Baron, C. Fair Rosamond, and C. Guernsey Cream. But this year they had all put on their show in May and were devoid of blooms in June. 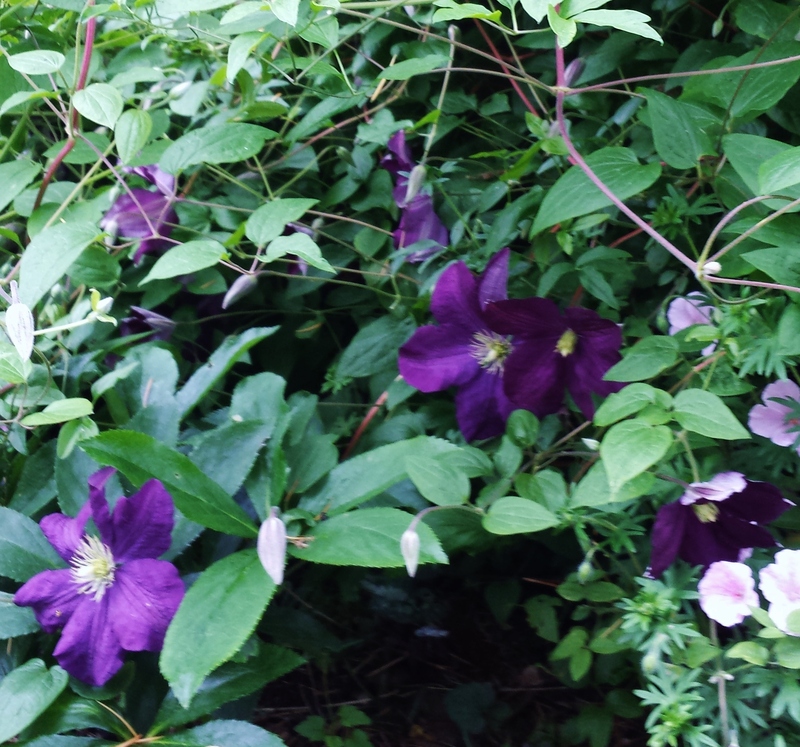 Fortunately, though, there was no dearth of clematis in my June garden–the July bloomers came to the rescue! 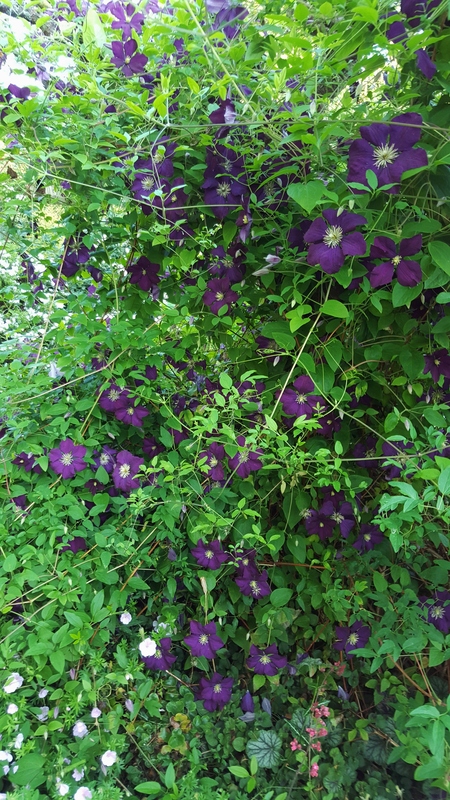 An excellent case in point is Clematis of the Month for June, C. Etoile Violette. This 10-year-old plant, which gracefully drapes itself over and through a dying Italian plum tree in the middle of my garden, had more blooms this year than ever before. I guesstimated over 1,000 blooms all at one time in mid-June. Check out the photos below, taken on June 13, of C. Etoile Violette from all sides. Choosing just one May winner this year was no easy task because many lovely clematis gracefully embellished my garden throughout the month. 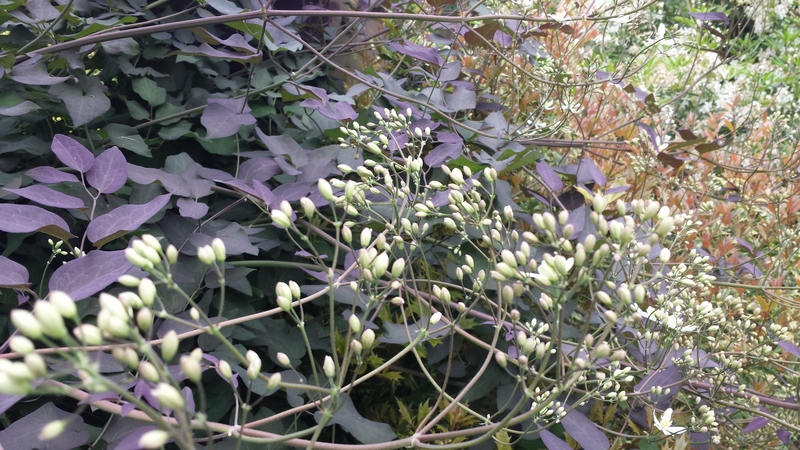 After much consideration, the clematis I chose to take the prize is Clematis CEZANNE, with it’s big cluster of blue(ish) satiny flowers, draped over the edge of my windowbox. This clematis, bred by clematis hybridizer Raymond Evison as a Patio Clematis, has a smaller root system than most clematis, making it perfect for a pot or, in my case, a large windowbox. Patio Clematis bloom in several flushes throughout the summer, especially when deadheaded or cut back after each flush dies down. Pruning is easy–just cut them back hard in late winter (even late fall in milder climates like Seattle). The runners up in May are no slouches. Check them out! 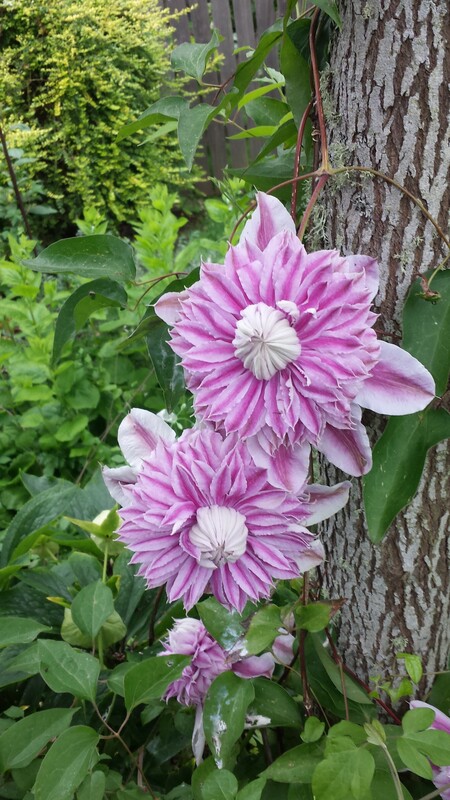 The delectable double blossoms of Clematis JOSEPHINE. Already the first blooms of Clematis Etoile Violette, which normally blooms for me late June to early August! 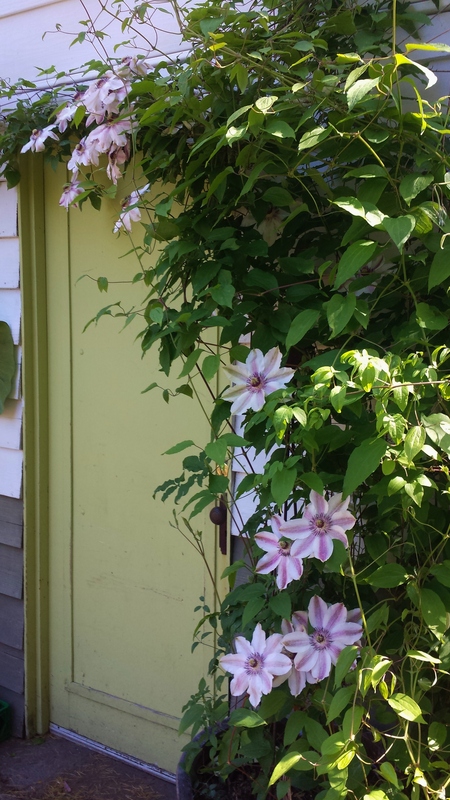 Clematis Fair Rosamond gracing a doorway, this year with very strong pink bars, making it appear to favor Clematis Nellie Moser. 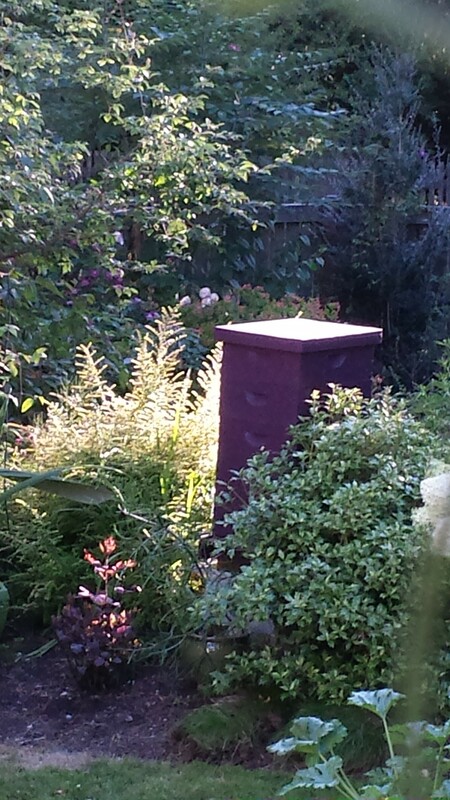 Clematis recta Purpurea, cascading down from its support and about to open its prolific and fragrant small flowers. 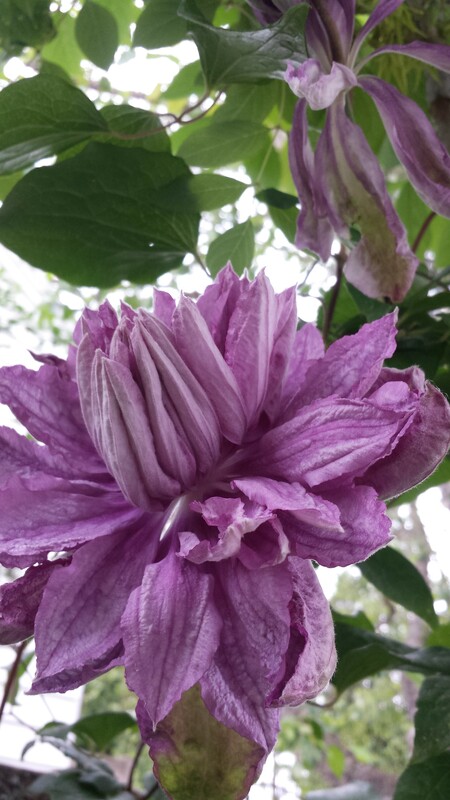 Clematis Tartu made a comely comeback after wilting last year! 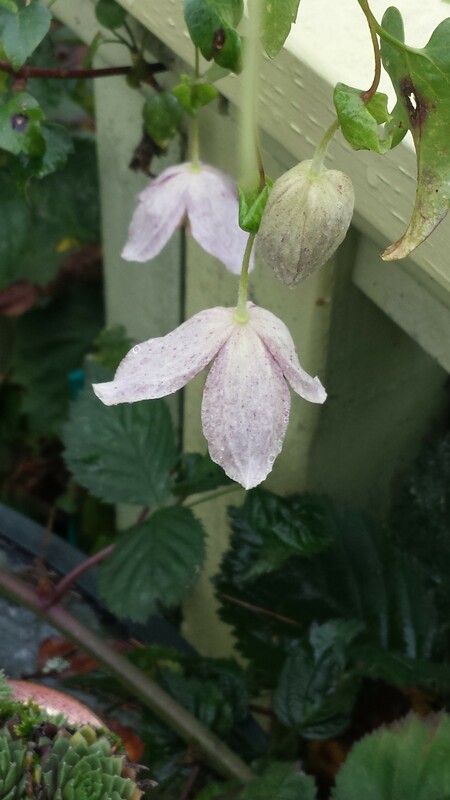 A slightly tattered Clematis Omoshiro (oh, those pesky slugs!). 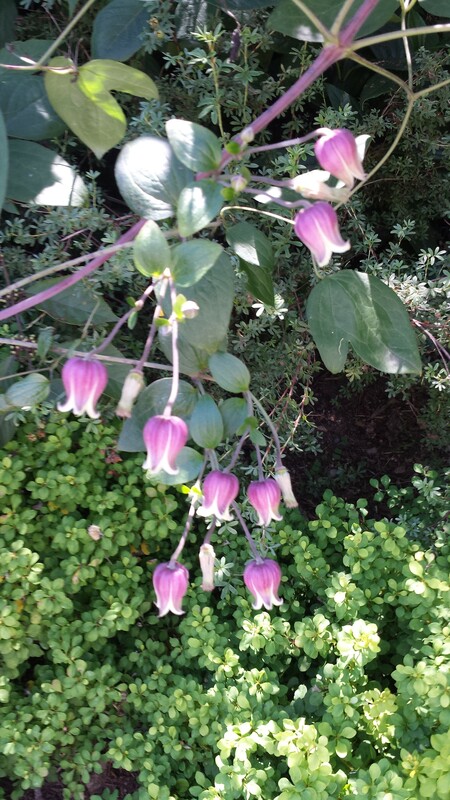 Clematis Fond Memories (photo taken by me at the Rogerson Clematis Collection in Lake Oswego, Oregon). Sadly, this one does not yet grace my own garden. 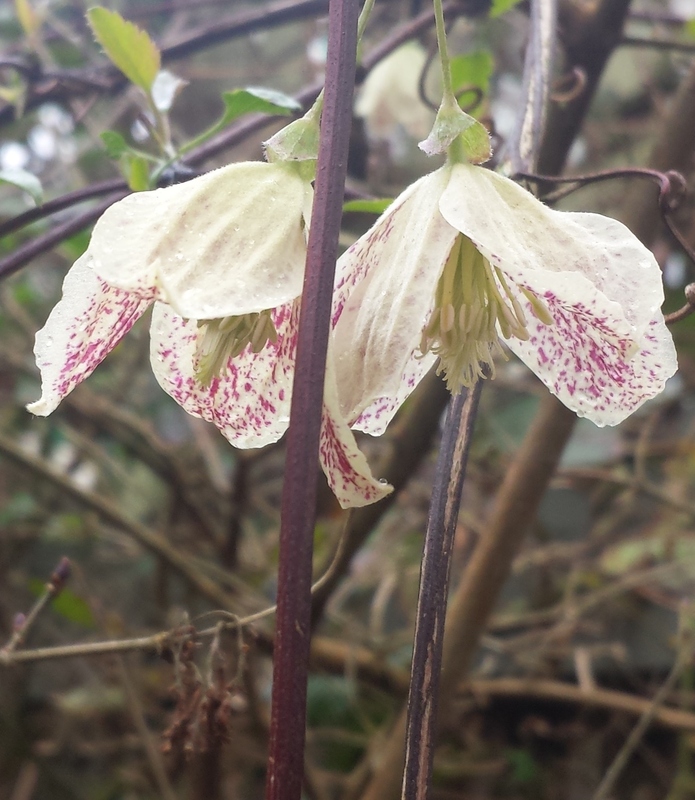 One bright sunny day last week, as I poked around in the back garden, I was delighted by several wintry blossoms on C. cirrhosa ‘Freckles.’ This Mediterranean clematis with a delightful scent is said to bloom from October through February. Mine, however, not being much for following rules, generally prefers blooming in August or March. I complained about my wayward clematis to a British clematarian friend. “Do you fertilize it in fall?” he asks. Well, duh, that makes sense. 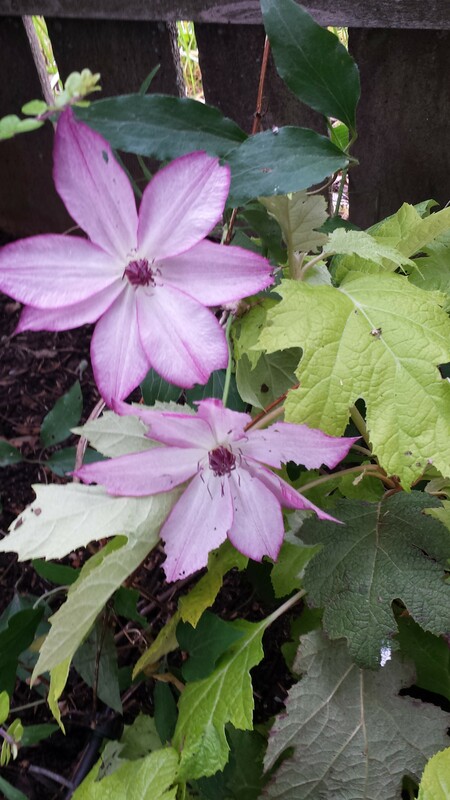 For a winter-blooming clematis to do it’s thing in winter, a fertilizer boost in autumn would certainly be helpful. Of course, I haven’t remembered to do it yet, but I will next fall for sure. For more information on this winter-bloomer, check out my February 2013 post (see list on the left). A Dutch blogger has also deemed C. cirrhosa ‘Freckles’ Plant of the Month for January–click here to see the Dutch blog. Use Google Translate to translate it into English (sort of). 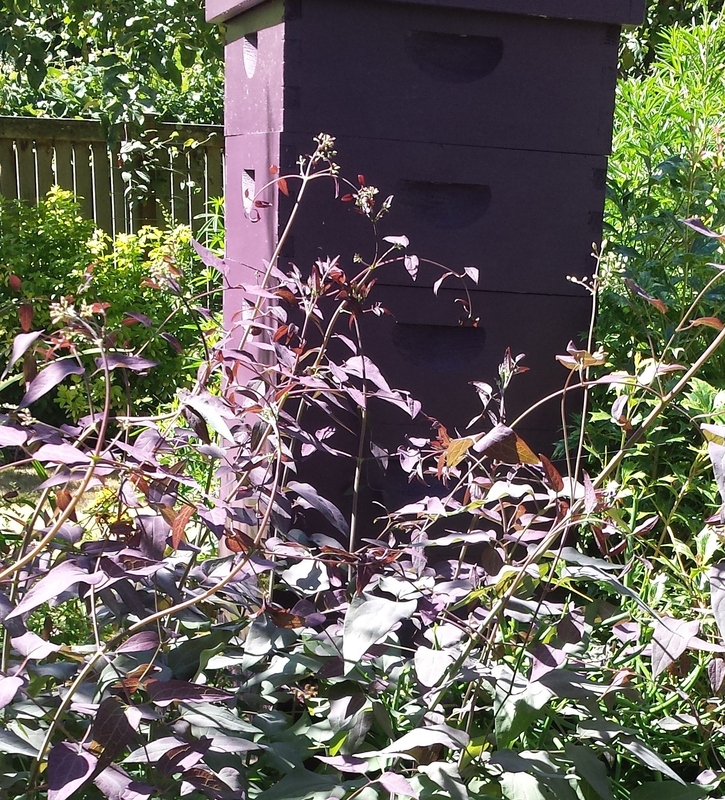 Clematis recta ‘Purpurea’ showing off its second growth of plummy purple leaves in July . 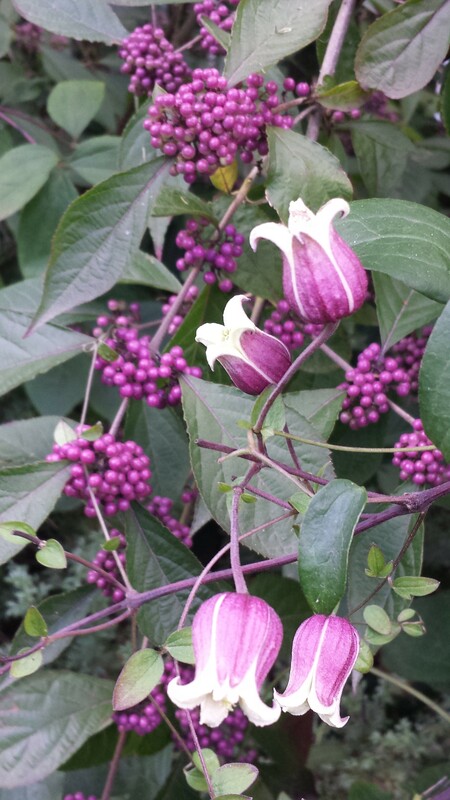 Clematis recta ‘Purpurea’ is an upright plant that does not climb (the recta part of its name means erect) . In my garden, the show starts in April, with the plant pushing fat purple buds up through the earth. As time passes the buds elongate and stretch up and up. 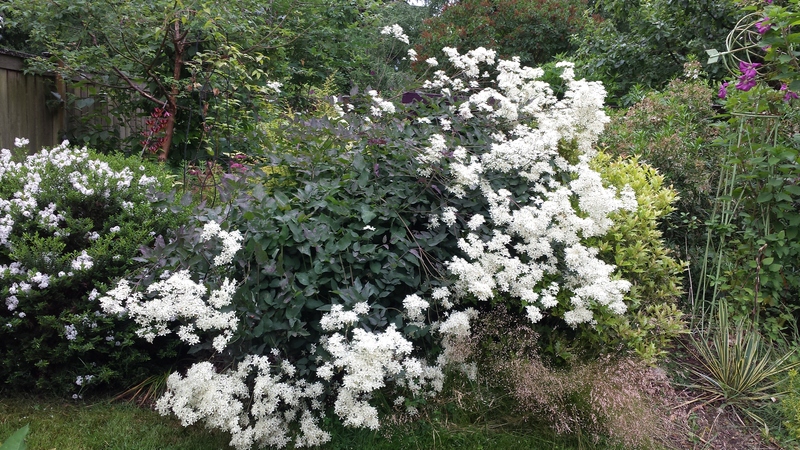 By early June, C. recta ‘Purpurea’ has reached six feet and begins to open small star-shaped white flowers. Later in June it blooms extravagantly with thousands of tiny white flowers that waft a delicious fragrance through the garden. 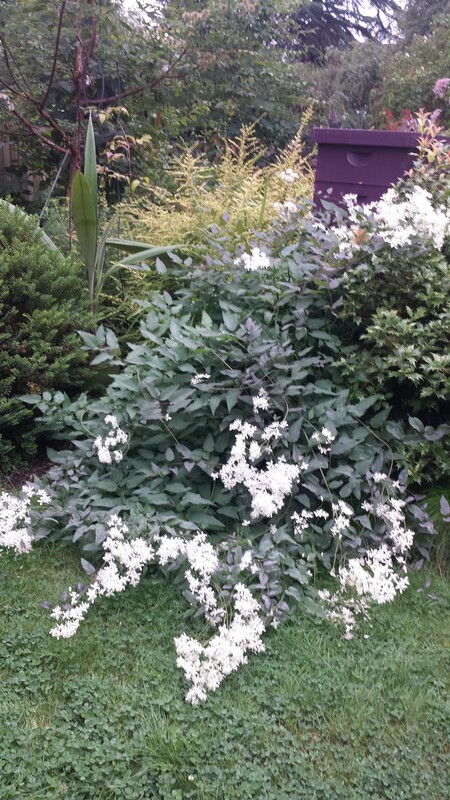 The weight of the blossoms eventually causes the plant to flop, but oh, so gracefully. 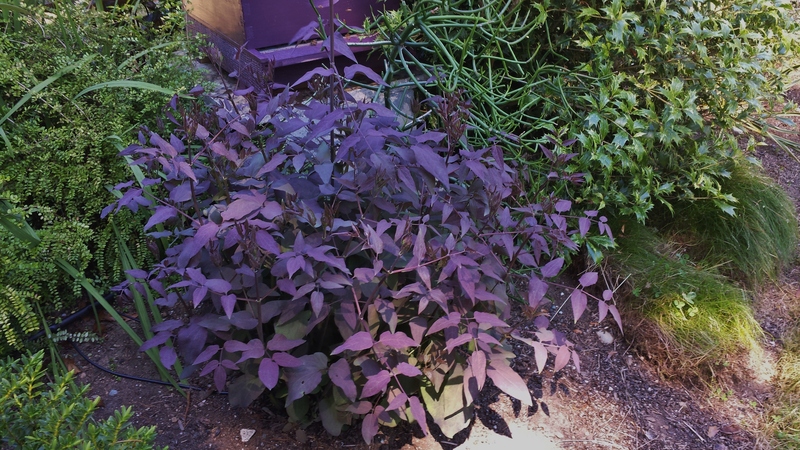 As so often happens with purple-leaved plants, the leaves begin to lose that luscious purple color, but there is a solution! 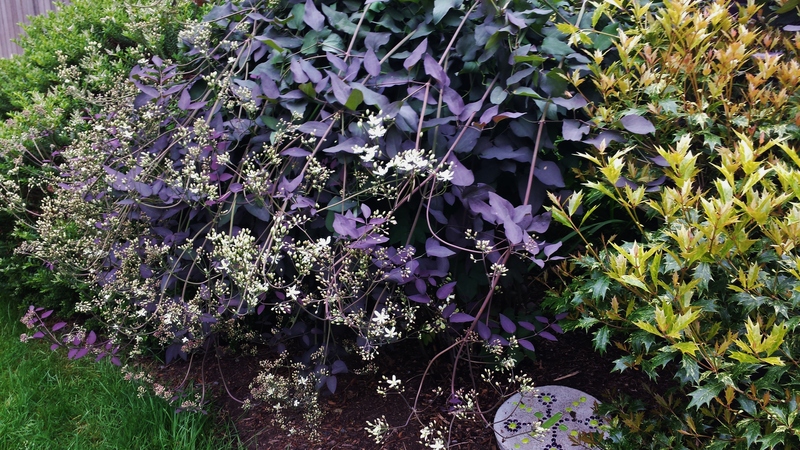 Clematis recta ‘Purpurea’ is a great plant choice for any garden!